Graphic designer turned full-time mum, carer, and disability advocate Michelle Jankovic has covered so much ground in a short space of time. Her work for the community is extensive and her achievements include receiving the inaugural La Trobe Community Award, the competitive AMP Tomorrow Maker Grant, the Casey Cardinia Home-Based Business Award, and building her own disability service business Helping Hand Is Here and MyCare. But all of this hasn’t come easy – it all started with the birth of her first child, Bailey, and his journey with cerebral palsy. Bailey was born eight weeks premature and has undergone 16 surgeries and hundreds of specialist appointments in his young 14 years of life. 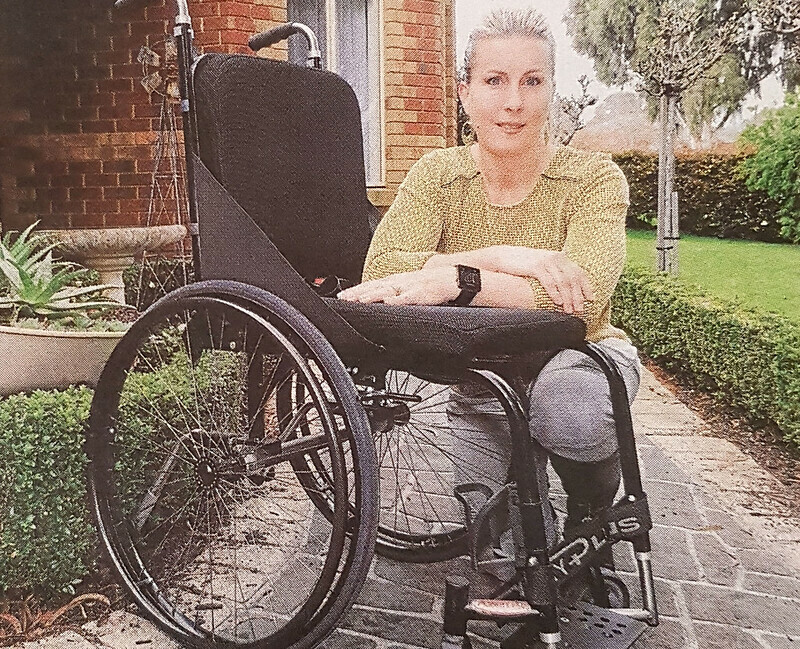 Projected into the daunting medical world of disability, Michelle found herself undertaking hundreds of kilometres of travel to various appointments, hours in hospital waiting rooms, and mounds of healthcare paperwork. I felt a big slippage in the health care system with endless appointments and endless amounts of paperwork. I was seeing the black hole. Experiencing the frustrations of the disability system first-hand, Michelle decided to act. That’s where my disability activism and work really started, from listening to other families and hearing the same unanswered questions come up over and over again. 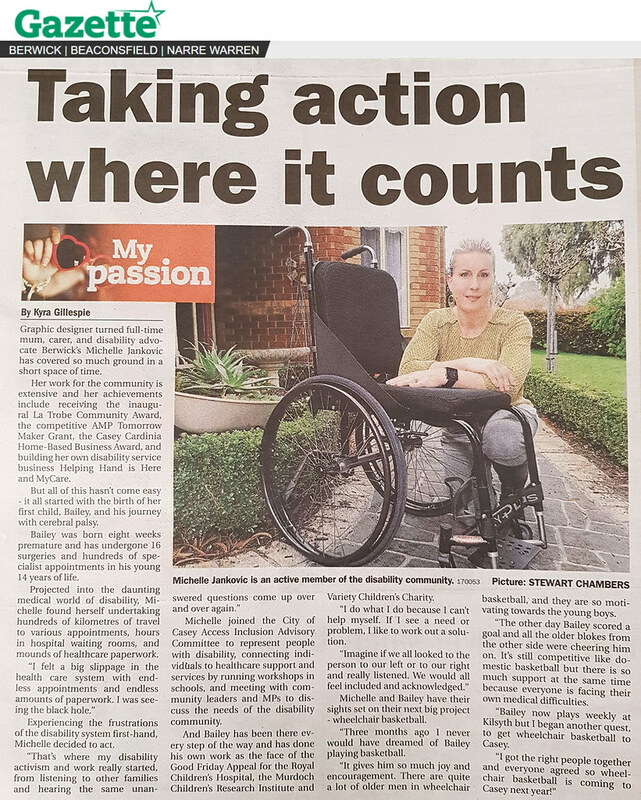 Michelle joined the City of Casey Access Inclusion Advisory Committee to represent people with disability, connecting individuals to healthcare support and services by running workshops in schools, and meeting with community leaders and MP’s to discuss the needs of the disability community. And Bailey has been there every step of the way and has done his own work as the face of the Good Friday Appeal for the Royal Children’s Hospital, the Murdoch Children’s Research Institute and Variety Children’s Charity. I do what I do because I can’t help myself. If I see a need or problem, I like to work out a solution. Imagine if we all looked to the person to our left or to our right and really listened. We would all feel included and acknowledged. Michelle and Bailey have their sights set on their next big project – wheelchair basketball. Three months ago I never would have dreamed of Bailey playing wheelchair basketball. It gives him so much joy and encouragement. There are quite a lot of older players in wheelchair basketball, and they are so motivating towards the young kids. The other day Bailey scored a goal and some players from the other side were cheering him on. It’s still competitive like domestic basketball but there is so much support at the same time because everyone is facing their own medical difficulties. Bailey now plays weekly at Kilsyth but I began another quest, to get wheelchair basketball to Casey. I got the right people together and everyone agreed so wheelchair basketball is coming to Casey Basketball Association next year!